Steven Universe: Keep Beach City Weird! Steven gets taken in by Ronaldo Fryman's conspiracy theories about the strange happenings in Beach City. Poor Ronaldo. Looking so hard for something that isn't there when the truth — mysterious Crystal Gems with extra-dimensional powers — is so much more interesting. I laughed out loud at Pearl's dismissal of humans' attempts to make sense out of their short, pointless lives. Did you know that you can follow Keep Beach City Real on tumblr? 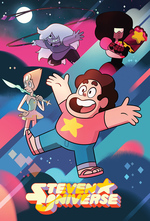 Also I feel like the polymorphic rocks thing is basically the gems. I hope he secretly stumbles upon the truth! No Home Boys makes that look more and more likely, sleeping bear, that Ronaldo's new conspiracy theory is uncomfortably on the nose. Remember, he said the polymorphic sentient rock people want to hollow out the Earth. We found out that new gems have been born on the Earth, and that Amethyst was one of them, and they emerge from the ground.